First of all I would like to say thank you to a couple of you (you know who you are) for helping me out with some fairy images. I have many ideas so this will truly help my creative process. Now to show you what I have been up to. I haven't made a lot of ATC's of late, just a few here and there for my FlickR group but other than that I was needing something a little different to play with. After visiting Agnes the Red Art site I found these really cool ATC shrines that she made and a tutorial on how she made her's and this sparked a whole new wave of creativity. I am so addicted to making them. I currently have these 3 and have more on the way. I think I will be posting these in my FlickR album but if you want to make a trade even for another ATC I would certainly consider it. You can email as well by clicking on my email button on the sidebar. 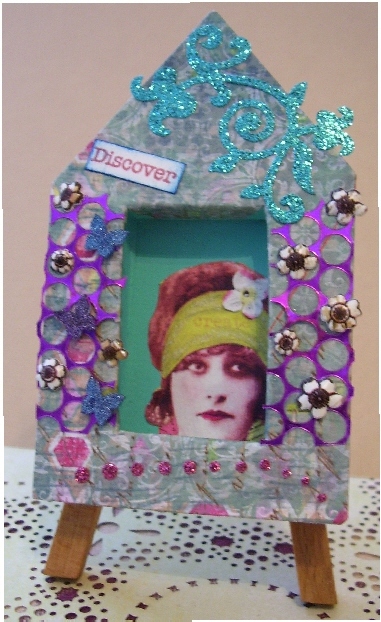 The inside little doorway is made using a matchbox drawer and secured in so it will not come out or off. 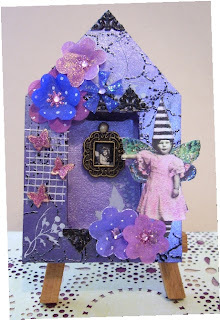 This first shrine is made using some new paper I bought and it was a collection of All Occasion paper pack made by K and Company. The sparkly sticker at the top was also included in the paper pack and the little white flowers.I also added some sequin waste that was generously given to me by my friend Jenxo ages ago. I hoard that stuff and for some reason I thought why not use it, are you just going to keep it and look at it once in a while. This time I had a great idea and put it up like a trellis so the butterflies (which I made if you click on the pic you can see them sparkle on the left hand side, my signature butterflies which I will be featuring on most of my shrines) could sit and land on, and the image is from Artchix Studio. This next shrine was inspired by another blog I visit, Kelsey over at KO OK blog. Kelsey teaches classes on various techniques and since she lives in Australia that is not possible for me to attend. Kelsey kindly shared this next paper but I can't tell you because I haven't asked permission to share it. Just let's say it involves paint, embossing and a few other things. I used German scrap , the flowers were inspired by Gingersnap Creations blog, they are having a challenge using coffee filters so I made some coffee filter flowers and painted them with Twinkling H20's. The filters were painted first then dried then I cut them out using a die cut on my Cuttlebug and added a bit of gel pen accents and some gems in the center. I made quite a few. They feel so delicate. I had to use the basket type filters the paper is more delicate than the cone shape but that is what I used and they still turned out so pretty.I also used some mesh that you use for dry walling on the LHS of the shrine and the little picture is a charm I bought (4 in a pack at the dollar store) I had some tiny images sent to me in an order from Artchix Studio a while back and the little girl fairy I adapted on one of my programs, and her dress I coloured in with chalk since it was a drab yellow. This one is called Family Portrait. I love this one. And finally this one is metal duct tape I used some alcohol inks on. Again German scrap from ArtChix Studio. A metal inspire charm Becky gave me ages ago, my last one I think. 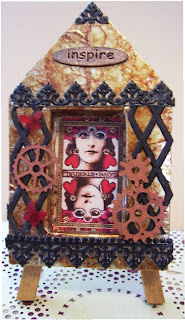 The gears are chipboard given to me by Jenxo and my tiny butterflies and an ArtChix image. Well thanks for dropping by. I haven't been too terribly busy of late. Winter keeps me indoors quite a bit, a time of hibernation. Can't wait for warmer weather. Til next time, be happy, do something good for someone and be creative if you can. It always feels so good. I have never made anything like these- VERY COOL! Wow, they are gorgeous Les!! I especially like the third one with the cogs! Gotta have a go at making one of these! Yep, I'm hibernating too LOL!! Roll on sunnier days!! Absolutely lovely! Your shrines are fantastic! Very lovely, Les! What a nifty idea. Something else to do with these fabulous matchboxes! These are great Les.. they are all gorgeous.. do love the cogs though.. that new paper is sooo pretty.. I know what you mean about the sequin waste.. I think it's because we can't find it here..